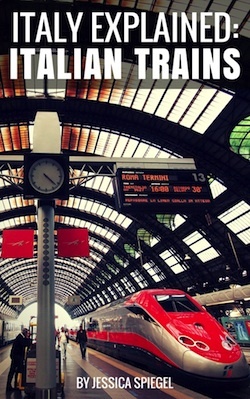 If you’ll be traveling to Italy and there’s even a remote possibility you’ll be riding the rails, do yourself a favor and load Italy Explained: Italian Trains by Jessica Spiegel onto your device of choice. Now. In her clearly written, concise guide, Spiegel covers everything you’ll need to know about maneuvering through the Italian train system from buying tickets to getting around the station. Her walk through how to use Trenitalia’s frustrating website is worth the price of the book alone, especially if you have limited Italian skills. Oh, and regarding that, there’s also a glossary at the end with a pronunciation guide so you can always whip out your copy of Italy Explained: Italian Trains to help you communicate with ticket vendors, conductors, and the like if need be. Five espresso cups out of five aka highly, highly recommended.